To eliminate the necessity of writing checks in very small amounts, it is customary to maintain a petty cash fund from which small disbursements are made. Examples are postage, delivery expense, telegrams, and so on. Each disbursement from the petty cash fund should be accounted for by a receipt. If no bill is presented, the one responsible for the fund should prepare a receipt and have the payee sign it. This is known as a petty cash voucher (as shown below). Under the imprest system, a fund is established for a fixed petty cash amount, and this fund is periodically reimbursed by a single check for amounts expended. There is nothing much to say about petty cash, but let’s go a bit deeper with how to set up and maintain the petty cash. It may be useful to you, who in touch with petty cash for the first time. An estimate is made of the total of the small amounts likely to be disbursed over a short period, usually a month. A check is drawn for the estimated total and put into the fund. The only time an entry is made in the petty cash account is to establish the fund initially, unless at some later time it is determined that this fund must be increased or decreased. The individual in charge of petty cash usually keeps the money in a locked box along with petty cash vouchers. The petty cash voucher, when signed by the recipient, acts as a receipt and provides information concerning the transaction. 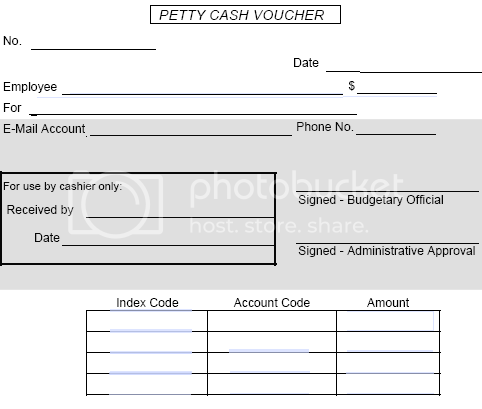 As each payment is made, the voucher is entered in the petty cash record under the heading, “Payments”. The amount paid is then distributed to the account affected. The columns are totaled in order to determine the amount chargeable to each account. A check is then drawn in an amount equaling the total amount disbursed. When the check is cashed, the money is replaced in the fund to restore it to the original amount. Each amount listed in the distribution section of the petty cash fund is entered as a debit to the individual expense. The total amount of the check is credited to Cash. Proof of petty cash is obtained by counting the currency and adding the amounts of all the vouchers in the box. The total should agree with the amount in the ledger for the petty cash fund. If it does not, the entry in the cash disbursements journal recording the reimbursement of the petty cash fund will have to include an account known as Cash Short and Cash Over. A cash shortage is debited and a cash overage is credited to this account. Cash Short and Over is closed out at the end of the year in to the Income Summary account and is treated as a general expense or miscellaneous income.